While a majority of the rules that follow directly come from the MSBL/MABL Rules and Regulations-January 2019, there are issues which are tournament-specific. With this thought in mind, the National Rules Committee has put together these rules, which will apply for this year’s tournaments. These rules, as they relate to the MSBL/MABL National Tournaments, are definitive and supersede any other sets of rules that the MSBL/MABL, or your local league, may have. These rules are also the basis for our league associated rules and regulations and should be used as that guideline as well. They will also appear in your tournament scorebook. There will be no requirement that all team members wear matching uniform tops and hats at our four January – May tournaments (Holiday Classic, Desert Classic, Kickoff Classic, Las Vegas Open). We would encourage teams to try and match uniform tops as best as possible. For the World Series and Fall Classic, the rule is mandatory for matching uniforms and hats! In addition, uniform numbers are mandatory on the back of the uniform shirts and each player must have a differentiating number. In the World Series and Fall Classic, a player may be denied participation without a matching uniform or “select” number. All Base Coaches must be in full uniform as well. In addition, rosters must be exchanged before each game detailing each player’s name an uniform number, not only for players attending that game, but the entire tournament approved roster. If not presented, this is protestable and a forfeit can be given. All batters and runners must wear a helmet with at least one earflap. The MSBL/MABL strongly urges that all helmets are double ear flapped, but at a minimum, the batter’s ear that faces the pitcher must be covered by an earflap. Catchers, while playing defense, must wear a protective helmet. All base coaches are also required to wear protective head gear while on the field of play and be in full uniform. There will be NO deviations/exemptions from this rule. No alcoholic beverages of any kind are permitted on the field or in the dugout during any National Tournament game. Please keep the consumption of these types of beverages limited to those areas away from the field or dugouts, and are also excluded from parking lots! Any participant who is found to be drinking during a game will be ejected and is subject to expulsion from the tournament. Alcohol is also not permitted in the parking lot of any fields used for our national tournaments. All Divisions are Wood Bat Only. Composite and metal-wood bats are permissible for Wood Bat only divisions. Upon protest, the penalty for using an illegal bat will be an out for the violating player. Teams must have eight (8) players for an official game. The team may borrow one player from the opposing team if the manager of this team consents. The team with eight may also borrow a player from a team other than the one that they are playing if, and only if, the opposing manager consents. Games will be forfeited if a team can not field at least eight players within 15 minutes of the scheduled start time, or officially adjusted starting time. If a team has nine players only and therefore bats nine players only, the opposing team will have the option of batting nine players as well. Players that will need courtesy runners must have their manager notify the opposing manager and home plate umpire at the home plate meeting. Otherwise, the opposing manager has the right to refuse the courtesy runner. Each team will be allowed a maximum of two players per game who can be classified as needing a courtesy runner. Each time a designated player reaches base, he will call time out and at that point will be replaced by the last batted out. If the last batted out also is listed as needing a courtesy runner, the second to last batted out will run. In the case that no outs have been recorded when the designated player reaches base, the last batter in the lineup will act as the last batted out. In the event that a player becomes injured during a game, and the maximum number of courtesy runners (2) have been designated, a pinch runner must be used and no courtesy runner will be allowed. If the offensive team replaces the runner with the wrong courtesy runner (a player that was not the last batted out) and the opposing team protests before the next pitch, then the original runner must run and the right to use the courtesy runner for this particular batter will be forfeited for the balance of the game. If the original runner inadvertently runs for himself and the opposing team protests after the first pitch, the right to use the courtesy runner for this particular batter will be forfeited for the balance of the game. If the right to use a courtesy runner is forfeited by violating any of the three rules above, the offending team will not have the right to use another courtesy runner for an injured player. All 55+/60+/65+/70+/73+ Divisions must the Shared Batting Position Rule only. The manager uses two players to share one batting position in the offensive lineup and during the game the manager decides who bats each time the batting position comes up. This can be implemented at the start of a game or can be added anytime during the game. He can then use the other player to run if he chooses to do so. When a player is used as a base runner in the Shared Position, he MUST bat the next time his position in the order comes to the plate. After that point, either of the Shared Runners may bat in this position. There is no limit to the number of shared line-up positions. Any player sharing a batting position is locked in that position for the duration of the game and cannot be used in any other batting order position. This rule replaces both A/B and courtesy runners. If teams choose to use the A/B and Courtesy Runner instead of the Shared Runner, they are entitled. For the sake of fairness and accuracy, the entire team’s roster, including last names and uniform numbers and not just the starting lineups, must be exchanged by teams before the start of each game. The Rules Committee suggests that teams come to the event with a complete prepared roster form with all of the above stated information. Each manager has the prerogative to bat as many players in his initial lineup as long as there are at least ten (10) hitters. If the manager wishes to add players to the bottom of the lineup (i.e. hitting positions 11, 12, 13, 14, etc. ), he may do so at any time. Added players to the bottom of the line-up may be added as individual hitters or as A/B. Any added player to the bottom of the lineup or pinch hitter must notify the opposing team manager of the batting order change. If no notification is made, and proper protest is made, an automatic out will be assessed to that batter. If a player is pinch hit for, he may not re-enter the game as a hitter, but may stay in the game defensively. Batters may not be deleted or skipped over, regardless of their batting position or when they were added to the game. If a team increases the size of their lineup to 15 hitters, they must always have 15 hitters in their lineup. If a team has more than 9 players and still only bats 9, they will be assessed an out each time the 10th batting position is skipped. Batting only 9 players is NOT a protestable offense. An exception exists to this aspect of the rule. If a player is forced to leave a game due to injury or ejection, a reserve player, not previously entered into the game as a hitter, must hit in the replaced batter’s place. If there are no reserves who can replace the individual, the spot is skipped and all hitters below that position move up. The first time this vacated spot comes up in the batting order, an out will be assessed. After that one time, no out will be recorded for skipping the spot vacated by the displaced player. A team MAY declare at the time that lineups are exchanged prior to the start of play that any batting order position will be occupied by two (2) players in each such batting position. That is, 3A/3B, 10A/10B, etc. The first time that position 3 gets an at bat, 3A would hit and the next time this slot hits, 3B would be up. Then 3A hits the third time this spot in the order comes up, and so on, alternating between these two players throughout the game. Once a team declares the use of this A/B system, it must continue using it for the remainder of the game. Hitters in the A/B position from the batting order may be pinch hit for, just as any other player. An A/B position may be added to the bottom of the lineup at any time during the game. Teams can not add a “B” batter to an existing lineup spot once the game begins. In the case that a team bats a player not designated on the roster given to the home plate umpire and the opposing team, that player, upon proper protest, will be found illegal and declared out after one pitch is thrown. The opposing team must protest this illegal player at the time of the offense. Penalties will not be retroactive and teams may not protest the use of this illegal player once the game is completed. If the team feels the player is not on the team’s tournament roster, then the protest needs to be lodged. In the case that a team has mistakenly put the wrong numbers for their players on the lineup given to the home plate umpire and the opposing team, the team will correct the error(s) with no penalty. The penalty for a team having a player bat out of turn is an out, if protested before the first pitch. All players may be substituted for, at any time, except the pitcher. Defensive players need not be in your batting order. In regards to substituting for the pitcher, if he is removed from the mound, he may only re-enter as a pitcher once in a game and must wait until the start of the next inning before he can resume pitching regardless of whether he stays in the game (i.e. as the right fielder). This can only be done once per game, irrespective of the number of pitchers. Needless to say, this is a critical issue surrounding the integrity of our league and the individual team. A manager has the right to question the age of opposing team members and we therefore require that all players/managers carry some form of photo identification (government or state issued) that indicates their date of birth. All participants should keep this identification with them during all games and if a manager believes that a player is underage, he should play the game under protest by notifying the home plate umpire and the opposing team manager. This protest must then be filed in person at the National Tournament Headquarters and the Rules Committee will hear the case promptly. If it is found that a player or players should not be participating in the tournament, then the offending team will forfeit that game on which the protest was filed, and any other games the offending individual participated in. Players must be 18 years of age by the first game of their respective divisions to participate. There is no upward age limit for the MABL Division, therefore anyone over the age of 18 can be a part of the MABL event. In order to participate in the Father/Son division, sons must be at least 16 years of age. The National Tournament Rules Committee will continue its position regarding the ruling that all individuals that play in the 25+, 30+, 35+, 40+, 45+, 50+, 55+, 60+, 65+, 70+ and 73+ Divisions must turn 25, 30+, 35, 40, 45, 50, 55, 60, 65, 70 or 73 during the calendar year. Therefore, if a player turns 25, 30, 35, 40, 45, 50, 55, 60, 65, 70 or 73 by December 31, 2018, he is eligible to participate in his respective division without an age exemption. All National Tournament games, with the potential exception of some playoff situations and/or weather related, are scheduled to be 9 innings in length. However, due to the large load of games to be played and our schedule constraints, no inning may start after 3:00 of the actual start time, not the scheduled start time. (For January – May National tournaments, this may be changed to 2:30 or 2:45.) The official start of the clock is with the first pitch. Please keep in mind that all innings that start before you reach the 3:00 point must be played to completion. There is no reverting back to the last inning or starting a new inning if the score is tied and you have played 3:02, etc. If, during the home team’s at bat, time expires with the home team leading, the game will stop at the point the 3 hour time limit has been reached. Once the 3rd out is recorded in the bottom of an inning, the new inning immediately begins. For example, if the third out is recorded in the bottom of the 8th inning and 2 hours and 58 minutes have elapsed in the game clock, the 9th inning immediately begins and may be started. Teams cannot arbitrarily stop a game (quit) if the score is lopsided and the team that is losing decides it does not want anymore runs scored against them. If a team “quits” before the time limit or 9 innings, the final score will be changed to reflect 10 additional runs times the # of unplayed innings. The game must be played a minimum of 5 innings/2 hours for this rule to be in effect. In addition, no team can arbitrarily forfeit a game because they will “benefit” by not playing. Any team that purposefully forfeits a game will be ineligible for the playoffs. Games can still end in a tie and standings are determined by points. For example, your team will receive two points for every win you post, one point for a tie and zero points for a loss. Obviously, the team with the most points will win their respective division and advance to the playoffs. The rules committee is concerned about possible unnecessary and violent collisions that may occur with the catcher at home plate, and with infielders at all bases. The intent of this rule is to encourage base runners and defensive players to avoid such collisions whenever possible. (2) Whether the runner actually was attempting to reach the base (plate) or attempting to dislodge the ball from the fielder. PENALTY—If the runner, a) could have avoided the collision and reached the base, or b) attempted to dislodge the ball, the runner shall be declared out even if the fielder loses possession of the ball. The ball is dead and all other base runners shall return to the last base touched at the time of the interference. (3) If the fielder blocks the path of the base runner to the base (plate), the runner may make contact or slide into, a fielder as long as the runner is making a legitimate attempt to reach the base or plate. If the defensive player blocks the base (plate) or base line clearly without possession of the ball, obstruction shall be called. The runner is safe and an immediate dead ball shall be called. obstruction, but will be ejected from the contest. The ball is dead. Any fielder may use a decoy only if it serves a strategic purpose. For example, if a fielder, who sees a man attempting to steal second base during a hit and run, looks upward into the sky and says that he’s got the pop-up when in fact the ball has been hit on ground is a legal decoy as it may cause the runner to retreat to first base and prevent him from advancing. However, if a fielder fakes a tag, forcing a player to slide, when there is no strategic purpose or apparent play, the runner will be ruled safe and all runners will advance one base. This is entirely an umpire judgment decision and not a rule that may be protested. Exception—A runner need not slide directly into a base as long as the runner slides or runs in a direction away from the fielder to avoid making contact or altering the play of the fielder. (1) “On the ground” means either a head-first slide or a slide with one leg and buttock on the ground. (2) “Directly into a base” means the runner’s entire body (feet, legs, trunk and arms) must stay in a straight line between the bases. (3) If a runner goes into a base standing up and does not make contact or alter the play of the defensive player, interference shall not be called. (2) Is on the ground at the time of contact and the fielder moves directly down the line between the two bases to attempt a play. (3) Makes a legal slide and makes contact with a defensive player who is on or over, but not beyond, the base. (4) When the base runner slides beyond the base, but does not (a) make contact with, or (b) alter the play of the defensive player, interference shall not be called. (a) Beyond the base” means any part of the offensive player’s body makes contact with or alters the play of the fielder beyond the base. (6) The runner illegally slides toward or contacts the fielder even if the fielder makes no attempt to throw to complete a play. PENALTY:(1) With less than two outs, the batter-runner, as well as the interfering runner, shall be declared out and no other runner(s) shall advance. (2) With two outs, the interfering runner shall be declared out and no other runner(s) shall advance. (3) If the runner’s slide or collision is flagrant, the runner shall be ejected from the contest. (4) If the bases are loaded with no outs, a double-play attempt is made, and interference is called, all other runners must return to their original bases. Each team is allowed to intentionally walk an opposing team player once in a game. Therefore, the total number of intentional walks each team is allowed each game is one. The team in the field will notify the home plate umpire of the intended intentional walk and the batter will automatically be awarded first base. No pitches are thrown. If a pitcher hits four (4) batters in one game, the pitcher must be removed. All protests must be lodged with the Tournament Director within a reasonable time frame after the completion of the game in question. All protests will be decided by the Rules Committee. Protests regarding a player’s eligibility must be made before the game or as soon as the player in question enters the game, offensively or defensively or directly right after the game. In the event of a rained out game or games, every effort will be made to make up the contest(s), but this is not guaranteed. Determination of eligibility to participate in the MSBL/MABL National Tournaments will be based solely on the decision of the National Tournaments Rules Committee. To be eligible to play in the playoffs and championship game, a player must have had at least one plate appearance in 2 round robin games or have pitched 3 outs in each of 2 round robin games or a combination of the two (ie: Pitch 3 outs in one game and 1 plate appearance in another) within the preliminary round robin. This must be documented in your scorebook and the scorebook of your opponent or the player(s) would be deemed ineligible. 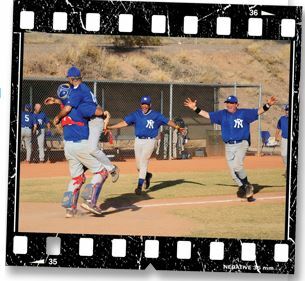 In order for a player to participate in the 2019 National Tournaments, he must be a member of a team from that MSBL/MABL league’s regular season roster that was submitted to MSBL/MABL National. Further, he must have fulfilled all financial responsibilities to the local MSBL/MABL league, as well as MSBL/MABL National, or be an approved pool player. The National Tournament Committee retains its right to issue exemptions where the best interests of the tournament and organization are served. In regard to players wanting to switch teams once they are at a National Tournament, no player may play for any team in the World Series or Fall Classic other than the team that he has been registered as a member of on the rosters that are submitted to MSBL/MABL National. If a player attempts to switch teams once a National Tournament begins, the player will be removed from the tournament and the team who utilized this switching team member will be forced to forfeit all wins that they have accumulated in the tournament, even those acquired before the player in question joined them. Furthermore, no player can play on two different teams within the same week of play (i.e. playing in the 35+ Central division and the 35+ Cactus division in the same week of tournament play) unless permission is granted. Very select exceptions will be made for 25+/30+/35+/40+/45+/50+/55+/60+/65+/70+/73+ week only with those players paying two full fees. In order to encourage the widest possible participation in National Tournaments, players who wish to enter National Tournaments and who are members of a local league not entered in the tournament may become “free agents” and join and/or be assigned to a team from another league entering the tournament. This program is not intended to encourage the assembly of “national all-star teams”, but it’s primary purpose is to foster participation for all leagues and their members. A player must be out of professional baseball (A, AA, AAA, or Major League) for three complete seasons before becoming eligible to participate in MSBL/MABL National Tournaments. Therefore, for the 2019 World Series and Fall Classic, any player who received compensation AND participated with a professional baseball team (A, AA, AAA or Major League) during 2017 or more recently is ineligible unless given special permission to participate by the National Tournament Rules Committee. For all Central Divisions – If a player has played pro ball (with the exception of Major Leagues) and has been out of pro ball for 20 years, this player is eligible to play in the Central Division. Ex-Pros are limited to 2 per team with no restrictions to position or limitation to round robin, playoff or Championship appearance.. In reference to players who played Rookie or Independent League baseball only, these players are ineligible unless they are out 10 years for Central. No allowed Independent/Rookie League players would be eligible to pitch, even if they did not pitch in their pro careers except for the 45+/50+/55+/60+/65+ Central Divisions. For all Cactus Divisions – For Cactus Division, Ex-Pro (AAA, AA, A) players are not allowed no matter the length of time out unless out of Pro Ball 30 years and played no higher than A ball. In reference to players who played Rookie or Independent League baseball only, these players are ineligible unless they are out 15 years for Cactus. No allowed Independent/Rookie League players would be eligible to pitch, even if they did not pitch in their pro careers, except for Divisions 45+ and higher. The fact that a player has played professional baseball at any level for any length of time must be disclosed on the roster submitted to MSBL tournament organizers. Failure to disclose a player’s ex-professional status may result in disqualification of the player and forfeiture of any games in which the player participated. At least 14 uniformed players must have at least one plate appearance during the game. (only applies in scheduled 9 inning games). Only in the case of the 14th batter will a plate appearance satisfy the required 14 rule. So long as the 14th batter is announced (steps into the batter’s box), and the 3rd out occurs before he completes his at bat then that will satisfy the 14 batters rule. There will be NO other exceptions to this rule. The rule of batting 14 players is in effect regardless if It is a completed 9 inning game or shortened by time! If a team has 15 or more uniformed players, they may elect to bat 14 players only (at least one plate appearance for 14 players). If a team has 13 or fewer uniformed players, the opposing team will have the option to bat the same number of uniformed players despite the number of uniformed players they have. Example: Team A has 13 uniformed players and Team B has 21 uniformed players. Team A must get all 13 players at least one plate appearance. Team B has the option of only getting 13 players one plate appearance as well, despite the fact they would normally have to get 14 players one plate appearance. In the event that the game ends with unbatted players, the violating team, under proper protest, will forfeit any win garnered. The rule of batting 14 players is in effect regardless if it is a completed 9 inning game or shortened by time. The 14 man batting rule is suspended for all playoff and Championship Games. While most teams have the ability to determine which division they will play in, that decision is not their own if the MSBL/MABL National Tournament Rules Committee feels, in their final judgment, that the division a team has chosen conflicts with their past records and talent level in their chosen division. In the event of any confusion, conflict or disagreement of any of the rules and regulations included herein, the decision of the National Tournament Rules Committee is final and binding.